For some of us it’s an easy task to get up in the morning and start off the day. But for the majority of us, especially teenagers, it’s quite the struggle to wake up at an early hour. Since school most likely won’t be starting any later than it does, here are 6 tips to make the mornings easier and more enjoyable. This tip is a little obvious: go to sleep earlier. 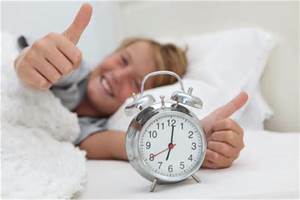 Most teens go to sleep around 10:00-11:00 and wake up for school around 6:00-7:00, which is only about 7-8 hours of sleep. Studies show that teenagers are actually supposed to get 9.5 hours of sleep which is a bit hard to fulfill considering any afterschool programs, hours of homework, and the laziness that stereotypically comes with the teenage years. But if you manage your time well, try to decrease any possible procrastination, and go to sleep at a good hour, the mornings will definitely come a lot easier, especially if you have a zero period class. Some days it feels like the hardest thing in the world to get out from the warmth and coziness of your bed. But it’s important to get out, even if it means rolling out of bed, because it’s extremely easy to let the comfort take over. So, something to do to help yourself wake up is to put on some energetic music you like to listen to. This will help you come alive, while letting you enjoy some tunes, which will also lift your mood and spirits in the morning. Another thing you can do is to open your window shades or turn on the light and let some light in, as well as opening your windows to let in the fresh air. Simple acts like these will wake up your senses and put you in a positive mood to take on the day ahead. Something that can also help is to either shower or wash/splash some water on your face. Plus, an added benefit is that you’ll be clean and fresh for the day ahead, which will make you feel very good, resulting in a good mood to start the day with. Showering or washing your face is really refreshing and certainly will wake you up. Exercising and/or stretching. Moving your muscles in some way in the morning will wake you up a lot. You might think that exercising will make you even more tired, but it does the complete opposite. Since your body has been laying completely still for the past 8 or so hours, moving your body gets you in the groove of the school day and gives you the energy you need for all the work and thinking you’ll be doing that day. The last tip is to find something exciting that the day ahead holds. Whether it’s something small like petting your dog in the morning, seeing your friends at school, or a bigger event like a school football game, finding something to motivate you to wake up is very important. Your mindset on not only waking up and going to school, but life in general, is everything. With a positive attitude towards whatever challenges or events, waking up will come much easier. Waking up in the morning may be difficult, but with these tips and the right outlook, it can be a much simpler task. Starting off the day right can affect the whole day ahead, so it is important to get off to a good start. Have a nice day!